Perennials, dioecious or nearly so, 30-120(-200) cm; colonial from deep-seated creeping roots producing adventitious buds. Stems 1-many, erect, glabrous to appressed gray-tomentose; branches 0-many, ascending. 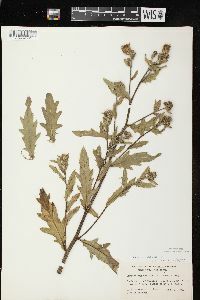 Leaves: blades oblong to elliptic, 3-30 × 1-6 cm, margins plane to revolute, entire and spinulose, dentate, or shallowly to deeply pinnatifid, lobes well separated, lance-oblong to triangular-ovate, spinulose to few-toothed or few-lobed near base, main spines 1-7 mm, abaxial faces glabrous to densely gray-tomentose, adaxial green, glabrous to thinly tomentose; basal absent at flowering, petioles narrowly winged, bases tapered; principal larger cauline proximally winged-petiolate, distally sessile, well distributed, gradually reduced, not decurrent; distal cauline becoming bractlike, entire, toothed, or lobed, spinulose or not. Heads 1-many, borne singly or in corymbiform or paniculiform arrays at tips of main stem and branches. Peduncles 0.2-7 cm. 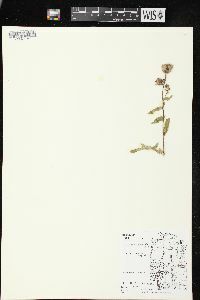 Involucres ovoid in flower, ± campanulate in fruit, 1-2 × 1-2 cm, arachnoid tomentose, ± glabrate. 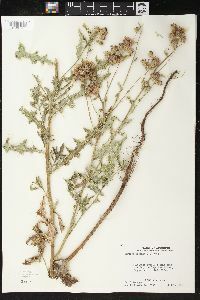 Phyllaries in 6-8 series, strongly imbricate, (usually purple-tinged), ovate (outer) to linear (inner), abaxial faces with narrow glutinous ridge, outer and middle appressed, entire, apices ascending to spreading, spines 0-1 mm (fine); apices of inner phyllaries flat, ± flexuous, margins entire to minutely erose or ciliolate. Corollas purple (white or pink); staminate 12-18 mm, (remaining longer than pappus when head is fully mature), tubes 8-11 mm, throats 1-1.5 mm, lobes 3-5 mm; pistillate 14-20 mm, (overtopped by pappi in fruit), tubes 10-15 mm, throats ca. 1 mm, lobes 2-3 mm; style tips 1-2 mm. Cypselae brown, 2-4 mm, apical collar not differentiated; pappi 13-32 mm, exceeding corollas. 2n = 34. Flowering summer (Jun-Oct). 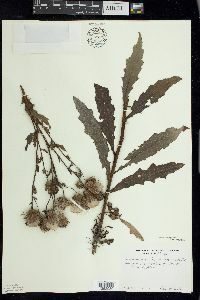 Disturbed sites, fields, pastures, roadsides, forest openings; 0-2600 m; introduced; Greenland; St. Pierre and Miquelon; Alta., B.C., Man., N.B., Nfld. and Labr. (Nfld. ), N.W.T., N.S., Ont., P.E.I., Que., Sask., Yukon; Ala., Alaska, Ariz., Ark., Calif., Colo., Conn., Del., D.C., Idaho, Ill., Ind., Iowa, Kans., Ky., Maine, Md., Mass., Mich., Minn., Mo., Mont., Nebr., Nev., N.H., N.J., N.Mex., N.Y., N.C., N.Dak., Ohio, Oreg., Pa., R.I., S.Dak., Tenn., Tex., Utah, Vt., Va., Wash., W.Va., Wis., Wyo. ; native, Eurasia. 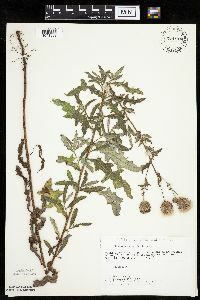 Cirsium arvense is one of the most economically important agricultural weeds in the world. 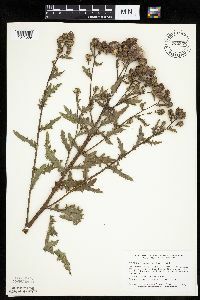 It was introduced to North America in the 1600s and soon was recognized as a problem weed. 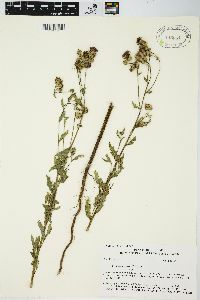 Weed control legislation against the species was passed by the Vermont legislature in 1795 (R. J. Moore 1975). 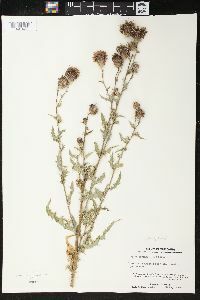 Canada thistle is now listed as a noxious weed in most areas where it occurs. It has very high seed production, and the runner roots readily survive the fragmentation that accompanies cultivation. 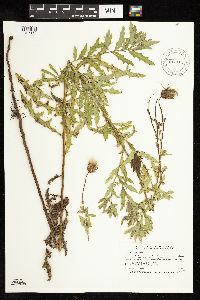 Numerous variants of Cirsium arvense have been named based upon such features as pubescence, extent of leaf division, and spininess. Although extreme variants can be strikingly different, they are connected by such a web of intermediates that there seems to be little value in according any of them formal taxonomic recognition. This species is infrequent to frequent in the lake area and is more or less local south of this area. 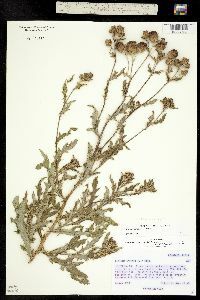 Since it is a very obnoxious weed, farmers have been made acquainted with it, and they usually exterminate it as soon as possible. There is a state law against harboring it, but the law is not enforced, and only occasional arrests are made. 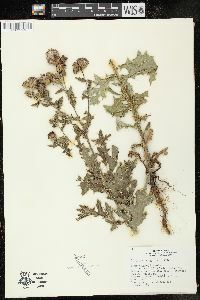 This species propagates by underground stems and spreads rapidly. 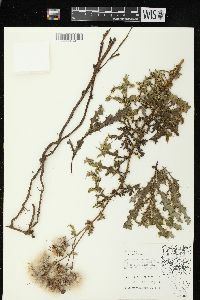 It is variable, and several varieties have been described. 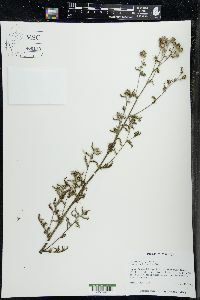 I have not collected all of them, but three varieties have been reported as established, and it is safe to assume that they will persist until destroyed by force. 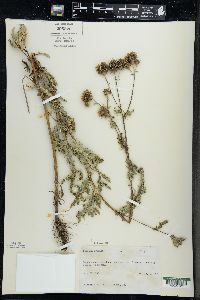 Several bulletins have been published describing the species and its varieties and give methods for its eradication. One to be recommended is Bulletin 414 of the Ohio Agricultural Experiment Station, by Freda Detmers, published in 1927. 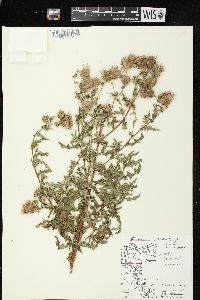 [Variety integrifolium has glabrous, entire leaves.] It was reported by Hansen (Proc. Indiana Acad. Sci. 35: 199. 1926) as established in Grant and Hancock Counties. It is regarded by some authorities as a species, and, from its appearance and behavior, I believe it is of specific rank. I know of a large colony in Wells County that was treated with chemicals for two years and still it persisted. I have not visited the colony recently. 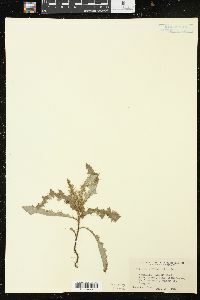 [Variety mite, with ruffled stem leaves,] was reported by Hansen (Proc. Indiana Acad. Sci. 34: 256. 1925) as established in Blackford, Grant, and Henry Counties. 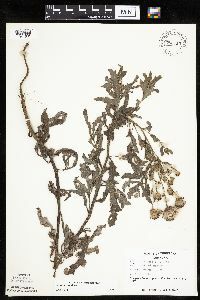 [Variety vestitum, with denticulate leaves and lanate peduncles,] was reported from Grant and Hancock Counties by Hansen. 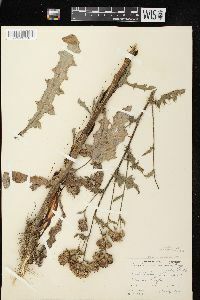 Colonial perennial 3-15(-20) dm from deep-seated creeping roots, subglabrous, or the lvs ±white-tomentose beneath; heads ±numerous in an often flat- topped infl, unisexual or nearly so, the plants polygamo-dioecious; invol 1-2 cm high, its bracts all innocuous, or the outer with a weak spine-tip ca 1 mm; fls pink-purple (white); achenes 2.5-4 mm; pappus of the pistillate heads surpassing the corollas, that of the staminate heads surpassed by the cors; 2n=34. A noxious weed of fields and waste places; native of Eurasia, now widely intr. in n. U.S. and s. Can. July, Aug. The var. arvense has merely toothed or shallowly lobed, weakly spiny lvs. 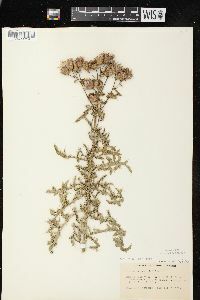 (C. setosum; C. a. var. mite) The more common var. horridum Wimmer & Graebner has more spiny, deeply pinnatifid lvs.